There are references in various places to the passengers of the Francis and Dorothy. This transcript comes from EMIGRANTS TO PENNSYLVANIA 1641-1819, A Consolidation of Ship Passenger Lists from the "Pennsylvania Magazine of History and Biography," edited by Michael Tepper, Genealogical Publishing Company, Inc., Baltimore, 1975, page 15. This book is also available on Family Tree Maker CD170. "The ffrancis and Dorothy ffrom London Richard Bridgeman Commander Arived at Philadelphia the 16th of the 8th month 1685. The passengers names are as followeth:"
(Included are): "John Peter Umstat and Barbara his wife, John his sonn Margaret and Eve his Daughters." 1985 Sheppard, Walter Lee, PASSENGERS AND SHIPS PRIOR TO 1684, The Welcome Society of Pennsylvania, 1985, page 166, shows the same info as above with the exception of Sheppard showing the ship to have arrived on the 12th of the 8th month and spelling Eave. I have not yet obtained a copy of the original manifest from which this information was taken, but it's out there and it's reasonable to believe that this information is reasonably sound. I will update this page when I get a copy. Along with wanting to have original documents for everything on this site, I'm particularly interested in seeing the spelling of Umstat shown on the original. It is shown differently in various published accounts, as are the first names of the family members, i.e. Eave. 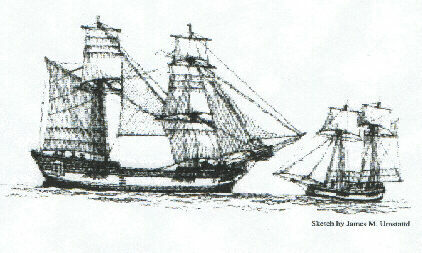 Note: The sketch of the ship above is NOT the actual Francis and Dorothy, but is similar. Betsy Umstattd, whose husband Jim did this sketch, says, "A ship historian tells me that information on 17th century ships is general. There are no pictures of specific ships from that period."